Everyone wants to have the slim and well contoured face so face slimming massager has came to solve the chubby cheeks and double chin problem. The Amazon imported eyxformula Face up Roller Massager in Pakistan is specialized to contour the cheeks bones and chin and make your face perfectly shaped. It is the perfect slimming tool which stimulates the facial muscles to work out and get in shape. · eyxformula Face Up Roller Massager has 3 rollers two roller are used as cheeks massager and one middle roller is used as double chin massager. · Rollers have the pallets which actually massage the skin. The chin massager has 8 pallets and each of the cheeks massagers has 15 pallets. · You can use it on face, chin, neck, shoulder, arms, back and forehead. · It also works as the muscles relaxer because it promotes the blood circulation from the targeted area. · It is the best beauty tool which is highly demanded by the women who have the bulky facial feature. · You will get the well contoured face in just 3 to 4 week on regular usage. It is recommended to use roll it on your face for 20 to 30 minutes, 2 to3 times in a day. You will get the excellent and prominent result in few weeks. It refines the jaw line and cheekbones, and reduces the double chin. · The eyxformula Face up Roller Massager enhances the elasticity of facial muscles and tightens the sagging skin. · You will get glowing, soft and well toned face naturally. · It reduces the facial muscles fatigue by relaxing them with smooth facial massage. If you are wandering for the best and imported quality face massager in Pakistan such as eyxformula Face up Roller Massager then explore the showcase of Amazon products in Pakistan at Shoppingbag.pk. You can buy it at the exceptionally reasonable price via the facility of Amazon online shopping in Pakistan and you will get the ordered product at any of your places with offered smooth payment method, cash on delivery. Face Chin Roller Massager :Chin massager consists of 8 massage pellets and the cheeks massager consists of 15 massage pellets on each side.Roller is very nice ,smooth to massage your face ,help you relax after work. Removable or combined to massage your face ,chin ,neck or other parts on body. Double Chin Remover :Natural way to massage your cheeks and chin .Increase the elasticity and tightness of your skin ,promote face blood circular,make face skin more soft and comfortable.Easy to control and handle ,Massage everywhere you want ,when you are in bed ,or watch TV,or reading book and other. 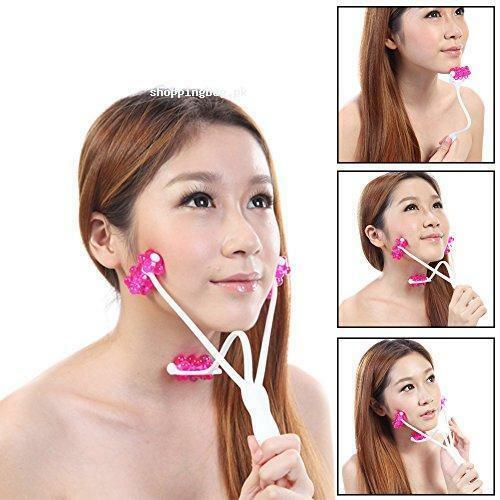 Facial Chin 2 In 1 Slimmer: Removable or combined as face roller massager and chin roller massager.Beauty tool of creating the graceful face curve,For exquisite face curve,increase elasticity of skin.Remover double chin, help to slimming down your face & neck. Product Details:Material:ABS;Size:23.4cm/9.2in*8cm*3.2in;Color:Pink or light pink ;Weight:0.08kg;Package Include: 1x Facial roller massager;100% SATISFACTION & MONEY BACK GUARANTEE:30 days refund and resend gurantee.if you have any question about this item, please feel free to contact with us, we will give you suggestion ASPS.